No more barking, panting, jumping, or running from window to window during car trips. Driving Edition is specially designed to help keep you alert and your dog relaxed. It has even helped dogs with car nausea and motion sickness. Many dogs love to go for a ride — but traveling in the car can also be extremely stressful. 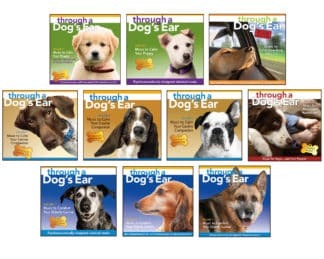 If your canine friend can’t settle down for the trip, gets the shakes, or pants excessively, now you have a drug-free solution with Through a Dog’s Ear: Driving Edition. This psychoacoustically designed music strikes the ideal balance of keeping you alert in the driver’s seat while soothing your dog’s nerves for a comfortable, pleasant journey. The breakthrough research behind Through a Dog’s Ear shows that the canine nervous system is extremely sensitive to sound — and that special arrangements of classical music have a profound soothing impact on anxious dogs. Through a Dog’s Ear brings you lively yet relaxing music designed especially for use in the car with Driving Edition: Music to Calm your Dog in the Car. 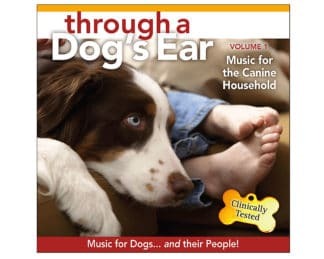 Whether you’re taking your four-legged friend for a short spin across town or on a long road trip, here is an invaluable musical companion to help both you and your dog enjoy the ride. Includes Travel Prep — an additional 20 minutes of music to prepare especially anxious dogs for riding in the car. Also included are specific protocols that address three degrees of auto anxiety. Dogs with no discernible automobile anxiety issues. Dogs with mild automobile anxiety issues. Dogs with moderate to extreme automobile anxiety issues. For dogs with automobile anxiety, the greatest relief is attained by following the “How to Use” training instructions contained in the CD liner notes. Click here for detailed Driving Edition instructions. This is absolutely wonderful for my two active dogs! It helps to calm them in the car, so that I can drive safely. And, I have to say, it is very enjoyable music to drive too. It has especially helped our new rescue who has separation anxiety and is very active. She is much calmer when we leave her at home. I also have the travel CD and it helps to sooth her while she is in the car. Have loved your music a long time – always play cd in the car to help my I yr old labrador with excitement to things outside the car. Just bought a iCalm player to take with us and share with my Mom and her golden with separation issues….its awesome !